ETH researchers have developed a biocompatible ink for 3D printing using living bacteria. This makes it possible to produce biological materials capable of breaking down toxic substances or producing high-purity cellulose for biomedical applications. There will soon be nothing that cannot be produced with 3D printing. However, the materials used for this process are still “dead matter” such as plastics or metals. The ETH logo, layer by layer printed in 3D with bacterial printing ink. 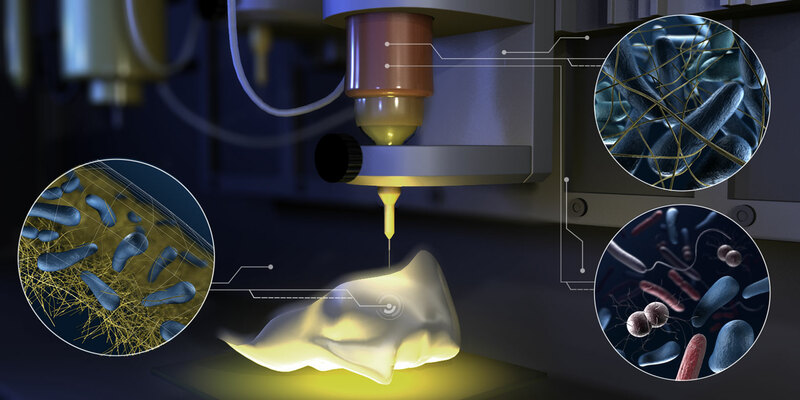 A group of ETH researchers led by Professor André Studart, Head of the Laboratory for Complex Materials, has now introduced a new 3D printing platform that works using living matter. The researchers developed a bacteria-containing ink that makes it possible to print mini biochemical factories with certain properties, depending on which species of bacteria the scientists put in the ink. Studart’s group members and first authors Patrick Rühs and Manuel Schaffner used the bacteria Pseudomonas putida and Acetobacter xylinum in their work. The former can break down the toxic chemical phenol, which is produced on a grand scale in the chemical industry, while the latter secretes high-purity nanocellulose. This bacterial cellulose relieves pain, retains moisture and is stable, opening up potential applications in the treatment of burns. The ETH researchers’ new printing platform offers numerous potential combinations. In a single pass, the scientists can use up to four different inks containing different species of bacteria at different concentrations in order to produce objects exhibiting several properties. The ink is composed of a biocompatible hydrogel that provides structure. The hydrogel itself is composed of hyaluronic acid, long-chain sugar molecules, and pyrogenic silica. The culture medium for the bacteria is mixed into the ink so that the bacteria have all the prerequisites for life. Using this hydrogel as a basis, the researchers can add bacteria with the desired “range of properties” and then print any three-dimensional structure they like. 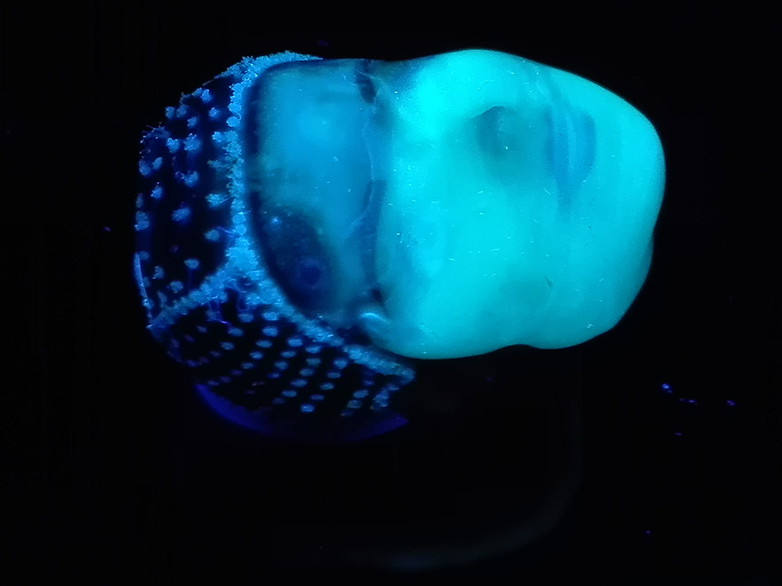 Bacteria-containing ink can also be printed on a complex three-dimensional surface such as this doll’s head. During the development of the bacteria-containing hydrogel, the gel’s flow properties posed a particular challenge: the ink must be fluid enough to be forced through the pressure nozzle. The consistency of the ink also affects the bacteria’s mobility. The stiffer the ink, the harder it is for them to move. If the hydrogel is too stiff, however, Acetobacter secretes less cellulose. At the same time, the printed objects must be sturdy enough to support the weight of subsequent layers. If they are too fluid, it is not possible to print stable structures, as these collapse under the weight exerted on them. “The ink must be as viscous as toothpaste and have the consistency of Nivea hand cream,” is how Schaffner describes the successful formula. The scientists have named their new printing material “Flink”, which stands for “functional living ink”, and recently presented the technique in the journal Science Advances. As yet, the material scientists have not studied the lifespan of the printed minifactories. “As bacteria require very little in the way of resources, we assume they can survive in printed structures for a very long time,” says Rühs. However, the research is still in its initial stages. 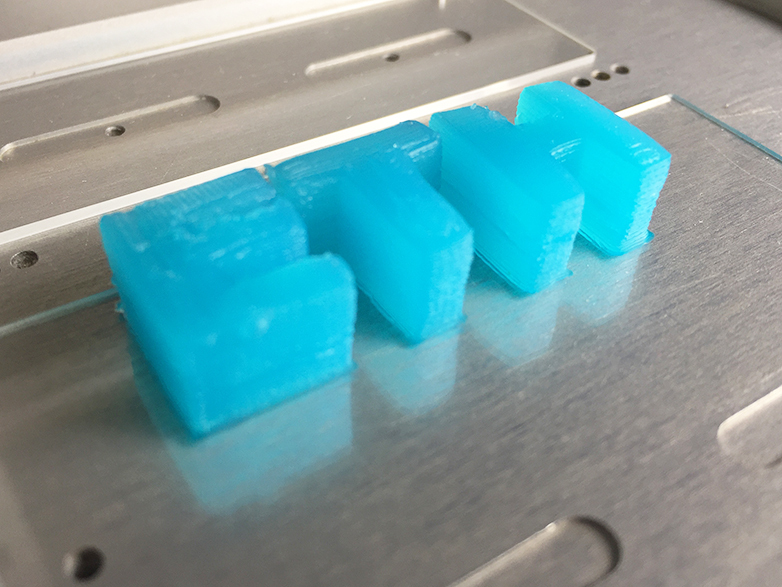 “Printing using bacteria-containing hydrogels has enormous potential, as there is such a wide range of useful bacteria out there,” says Rühs. He blames the bad reputation attached to microorganisms for the almost total lack of existing research into additive methods using bacteria. “Most people only associate bacteria with diseases, but we actually couldn’t survive without bacteria,” he says. However, the researchers believe their new ink is completely safe. The bacteria they use are all harmless and beneficial. 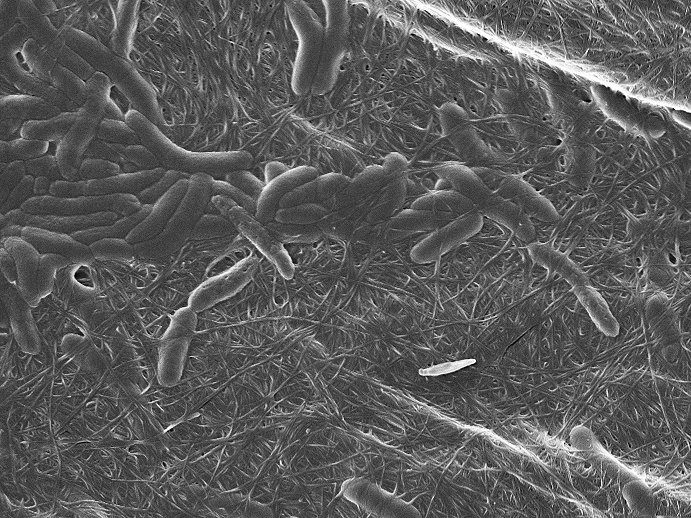 Rod-shaped bacteria produce cellulose, recognizable as a thread-like structures. In addition to medical and biotechnology applications, the researchers envisage many other potential uses. For example, objects of this kind can be used to study degradation processes or biofilm formation. One practical application might be a bacteria-containing 3D-printed sensor that could detect toxins in drinking water. Another idea would be to create bacteria-containing filters for use in disastrous oil spills. First, it will be necessary to overcome the challenges of the slow printing time and difficult scalability. Acetobacter currently takes several days to produce cellulose for biomedical applications. However, the scientists are convinced that they can further optimise and accelerate the processes. The development of special materials for 3D printing is a speciality of ETH professor André Studart’s research group. For example, he and his interdisciplinary team have also developed a printable high-porosity ink made of ceramic, which allows the printing of very lightweight bone-like structures used for energy production. Source: ETH Zurich, press release, 2017-12-01.